RAVENNA evangelist, Andreas Hildebrand of ALC NetworX, will be either presenting or participating in no less than five different events at the show dealing with a variety of AoIP topics. On Wednesday afternoon, Andreas is hosting a panel discussion on “Real-world AES67 Networking” on the Broadcast Audio Expo stage located on the show floor. Panelists include Nicolas Sturmel from Merging, Claudio Becker-Foss from DirectOut, Jeffrey Stroessner from Lawo and Will Hoult from Focusrite. Next, NA04 on Thursday afternoon, entitled “ST2110 & AES67: the audio parts of ST2110”, describes the basic principles of AES67 and the commonalities, differences, and constraints defined in ST2110 with respect to synchronization and transport of audio essence streams. Included is a brief outlook on how transport of non-linear audio formats (AES3) are likely be defined in ST2110. 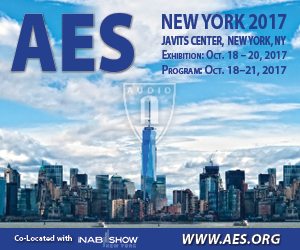 Friday is packed with three sessions: NA05 is a presentation on “AES67 interoperability – Network Audio Systems: a report on the state of the technology” and focuses on how to achieve interoperability within the AES67 standard. The panelists – including Greg Shay from Telos and Nicolas Sturmel from Merging - will share their own experience in preparing for interoperability showcases, designing products, configuring the network and accommodating the various choices left open to implementers within the standard. NA07 - “How to leverage AES67 to integrate multiple networked audio systems” - is the session that really deals with the nitty-gritty of how to set up an AES67 network in practice. Andreas Hildebrand will be co-presenting along with Will Hoult from Focusrite and Greg Shay from the Telos Alliance to take participants through the workflow of configuring audio streaming from one networked audio platform to another using AES67. Practical, hands-on demos will enable attendees to see how AES67 complements the various AoIP solutions including RAVENNA, Dante and Livewire+ allowing for networked audio interoperability using standard IP techniques. Topics covered will include network configuration, stream setup on each of the platforms, and troubleshooting. Finally, Hildebrand will present a short version of the previous session in NA08 – “AES67 Practical” for anyone who missed the NA07 session or wants a more condensed overview. When he’s not busy presenting, Andreas can be found on the Lawo booth #824 along with the RAVENNA demo rack.